Well that's because it's the title of an intriguing book written by Linda Lou, blogger, writer, stand up comedian and an inspiration to anyone who is looking to 'start over' and head in a new direction. I first came across Linda Lou some years ago on Roseanne Barr's blog forum. Her posts were wise, down to earth and quite frankly hilarious. I then started reading her blog, Linda Lou Live from Las Vegas and listening to her talk radio show, Aging Nymphs. She is entertaining and oh so.....energetic. Linda Lou has been working on this, her first book, for some time and her followers have been excitedly awaiting it's release. When Linda Lou sent me the book in late 2009 I started reading it straight away and didn't put it down until it was finished. The book is a very funny yet poignant account of Linda Lou's first year alone, after a midlife divorce from someone who was her perfect soul mate, well....perfect that is, until he had one drink too many. Did she rise to the challenges life threw at her? Oh yes, plus some. At 46, she started doing stand up comedy for the first time ever. Now that is courageous! In her book, Linda shares the roller coaster of emotions she went through after her relationship ended -no holds barred. She has taken a challenging time in her life and shown that we can indeed live and learn as long as we keep moving forward. As Linda Lou says, "Missteps are inevitable for those who brave the mighty risks of the stage, no -one gets through unscathed." Just like life. It's worth remembering this line every time we start to have a pity party about those non palatable things life sometimes throws our way. None of us is immune from sadness, upheaval or having our dreams come crashing down around us. It's something we all have in common and should share more readily. And as Linda Lou's book shows, despite the turmoil, everything does eventually unfold in some kind of divine order. Some people come into our lives for a reason and they also leave our lives for a reason. And even though the reasons may not always be apparent, our lives are left richer for the experience. 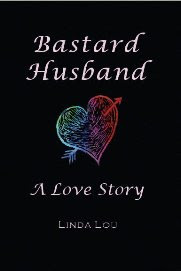 Instead of making a comment on my blog please go and check out Linda Lou's website http://www.bastardhusband.blogspot.com/ to find out more about her, her writing, her radio show and her fabulous and brave book. And at the risk of sounding like an infomercial, you will not be disappointed! That's a guarantee! PS. Apologies Linda Lou, this has taken far too long to post! Congratulations on a wonderful book and here is to many more.